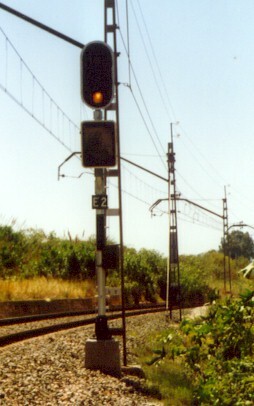 Main signal showing stop. As this signal does not carry a [P] board, passing is not permitted unless by special order. The round head below the main head may display a lunar white light, in that case a train movement may proceed as a shunting movement until the next main signal or the usual halt. 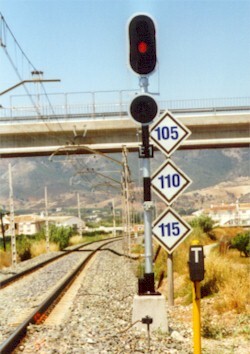 The diamond shaped boards impose a speed limit, if there are three instead of one board (as in this case), the topmost board applies for 'normal' trains, the centre board for 'A' and the lowest for 'B' trains. These boards are announced by round boards, a square board without inscription marks the end of speed restriction. Approach: The next signal shows stop. The rectangular indicator below the main head may show a number, this would be a warning that the indicated speed must not be exceeded at the next signal (unless that signal then displays 'clear, expect clear'), and that the signal behind the next shows stop. 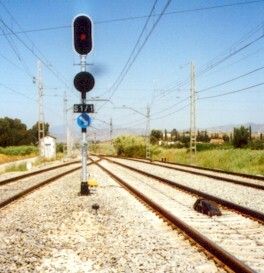 Signals in Spain are usually to the right of the track. This one is exceptionally placed to the left, so it carries a blue assignment board. 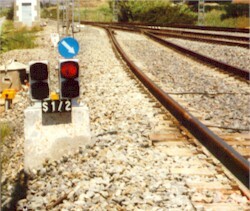 In front of the signal you can see the track magnet protecting this signal by means of the A.S.F.A (Anuncio de Señales y Frenado Automático, Announcement of Signals and Automatic Braking). 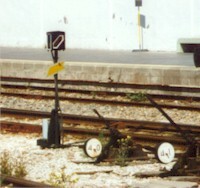 Dwarf main signal at stop, also exceptionally placed to the left of the respective track. It could also display slow or shunting permitted. Detail of the magnet. It looks a little like a Belgian 'crocodile' in that it is mounted between the rails but operates by induction like the German Indusi. 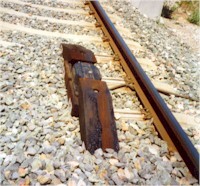 The magnet is mounted a little to the right from the centre, so it does not affect trains running in the counter-direction. 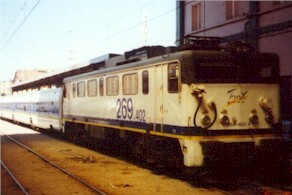 Inclination marker: Downgrade 2.3 mm/m for the next 600 m.
A Talgo 200 in the Malaga station.